Slow Factory: Seville: "Great is the enemy of good"
Seville: "Great is the enemy of good"
The People for Bikes website has a nice, short article about the recent very rapid increase in cycling mode share in Seville, Andalusia (Spain), location of the Velo-city cycling conference which ends tomorrow. The separated cycling infrastructure - Seville was awarded the UN Habitat Best Practice Award for it's creation - was cited as the main reason for this. 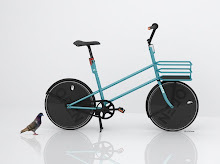 The bike mode share is about 7%. What is the breakdown regarding gender, age and income level? “Great is the enemy of good.” The city’s infrastructure emphasizes network connectivity, not perfection. It’s far from the polished bikeways of Northern Europe, but the protected bikeways of Seville are safe, convenient and get you where you need to go without interruption. First of all, I am happy to find out that most bike space was taken from car space. But I don't understand how bike space taken from pedestrian space can be compensated elsewhere. After all, it's not like carbon and e.g. trees -- and how do pedestrians move in these spaces after losing space? Of course it is just political. Certainly this lack of perfection - and conditions are certainly not perfect in many Northern European towns or even the best of them - is less important if unwarranted by the great but still low 7% mode share - but what if demand increases further? Will there be enough pressure to, for example, make double lanes single and a counterpart added to the other side of the street? The example photo in the linked article has a two-way on a one-way street which looks a 3- or 4-lane motorized traffic canal with parking removed on one side for the bike stuff. And regarding "without interruption" I would like to see an example of major crossroads. Hopefully some colleagues and others who are there can fill us in. Last but certainly not least, do the citizens of Seville deserve less than people in Amsterdam, Copenhagen etc. ? Certainly not, and regarding budgets and politics the very important question that needs to be made is if infrastructure for motor vehicles is just as far from perfection there. From what I have read and heard there are other things which help make Seville great. It is certainly always a bit nicer to cycle in the sunshine with a good meal of fresh food at the end of your journey. 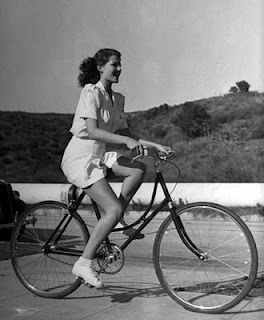 Rita Hayworth's father is from Seville (from Rides a Bike). Well, the Sevilla issue is not so easy to comment. First of all, I must tell you that Sevilla has increased its number of cyclist enormously, even when the percentage of the rise is not so high than they show in their data, just because they don't mention they didn't take account of pedestrians when they calculate de modal split (and pedestrians mean a 36% of all travels). It's true that most of space taken for cycle paths comes from parking lots, but what is also true is that, in most of the cases, cycle paths are done at sidewalk level, so they interfer the walking itineraries, mostly on crossings. You are right when you spot the question of the spaces stolen to pedestrians. I also want to add the freedom drop from them, that is maybe more difficult to value and impossible to return. About the type of cycle path choosen, I agree that is really narrow, problematic because of the bi-directionality and not enough well managed at junctions, but people is happy or, at least, easy-going with them. I hope this responds to your questions. I was happy to see that in Sevilla things are happening on the streets. As a tourist I really enjoyed the 'ringroad' cycle track. - Yes it was narrow, but it was never really dangerous and people were not annoyed. - There were men, women and children of all ages on this ring road using it for utility purpuses, but also recreation. - there were cyclists, roller blades and also people with wheel chairs. - before reaching a zebra crossing there are signs on the pavement: 10 - 5 - to warn you if you look down in stead of around you. - it was easy to find my way - I just had to be sure to reach the ring road at some point and I knew I would be able to find my pension. those cycle paths certainly have the merit of being there. - they do not reduce in any way the speed of car traffic probably just the other way round. Don't we want honest labeling on bicycle helmets?